Our small Studio Micro Fiber Cloths are great to have on hand in any yoga class. Your clients can use them to wipe off sweat, or to help them create tight binds in postures that don't slip apart when they are sweating. These super absorbent towels measure 14" x 14" and are completely lint-free. The amazing technology and effectiveness of the microfiber towel lies in the construction of the cloth. 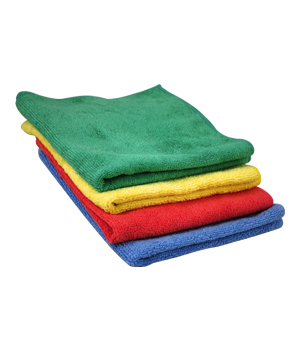 Microfiber towels are made up of approximately 90,000 fibers per square inch. Each microscopic fiber has been split, creating millions of wedge-shaped hooks. These hooks attract and absorb like no other material can! Towel will fluff and soften after washing. Machine wash in cold or warm water (not exceeding 120 degrees F).